Have been hunting for HP 78A (CE278A) toner cartridge with premium quality at competitive price? Rest assured, your seems-never-ending dilligent hunt can stop here at Printel. 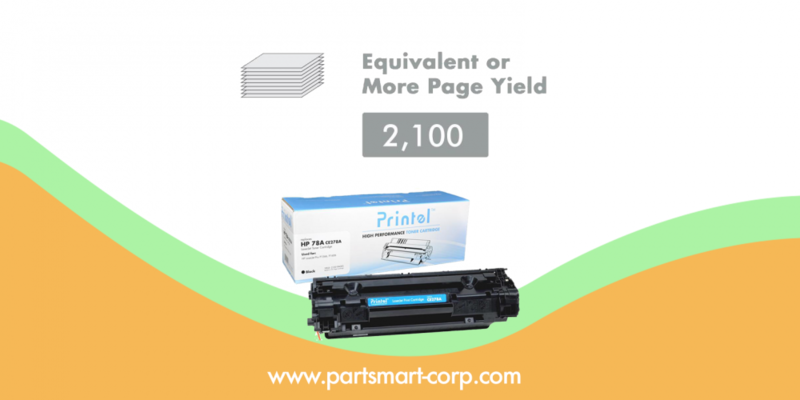 Printel is a brand created by laser printer parts and supply veteran, Partsmart Corporation. Partsmart specializes in design, development, manufacture, distribution of parts and supplies for printers as well as other office equipments. Beacause of the robust quality and extremely competitive price, Partsmart and Printel are brand names trusted by millions of businesss customers as well as retail customers. The reason is simple, we build quality products and bring substantial up to 70% cost saving to our customers. HP 78 A (CE278A) toner cartridge is compatible with HP LaserJet Pro M1536, HP LaserJet Pro P1566, and HP LaserJet Pro P1606 printers, as well as Canon LBP6200 and LBP6230 printer. Superior Quality Components. Printel brand new HP 78A contains high quality new parts including wiper blades, OPC drums, and other internal components. We fully assemble the toner cartridge and build it to ensure the highest quality prints and engineering efficiencies. In addition, we only use RoHs Compliant toner. Compared with other compatible brands, HP 78A (CE278A) compatible toner cartridge by Printel lasts a lot longer. Printel HP 78A toner cartridge provides the same page yield, 2,100 pages, as the original OEM toner cartridge by HP. Printel HP 78A (CE278A) toner cartridge is priced at $13.99 for each unit. Compared with HP original toner cartridge's insane $87 price tag, we save you more than 70% and bring you the same crisp and long lasting quality print. See what customers have said about Printel HP 78A toner cartridges. Purchase from Partsmart Store. You can purchase the HP 78A (CE278A) toner cartridge in a single pack, double pack or 3 pack. The more you purchase, the more you save. You can purchase directly from Partsmart store on this website. Simply follow link Printel Compatible HP 78A (CE278A) Toner Cartridge. We provide flat rate shipping option to help you save money. If the product you received is defective, simply use our hassel free return service to return the defective product. Purchase from Amazon.com. If you are Amazon prime member or prefer to purchase from Amazon, simply click Printel Brand New Replacement Toner Cartridge for HP 78A CE278A Black link to buy from there.